Did you ever wonder why your desk has corners? You don’t actually store anything on that part of your desk, do you? A better desk would have round corners, to make it easier for you to get around in your office. And a better desk would probably be a standing desk, right? Now that you mention it, a better desk would have cord management, and integrate all sorts of tech, and get rid of the junk that fills our workspace and makes it hard to get things done. Someone should really rethink this. Hell, someone should rethink everything about desks. And fortunately, someone has. 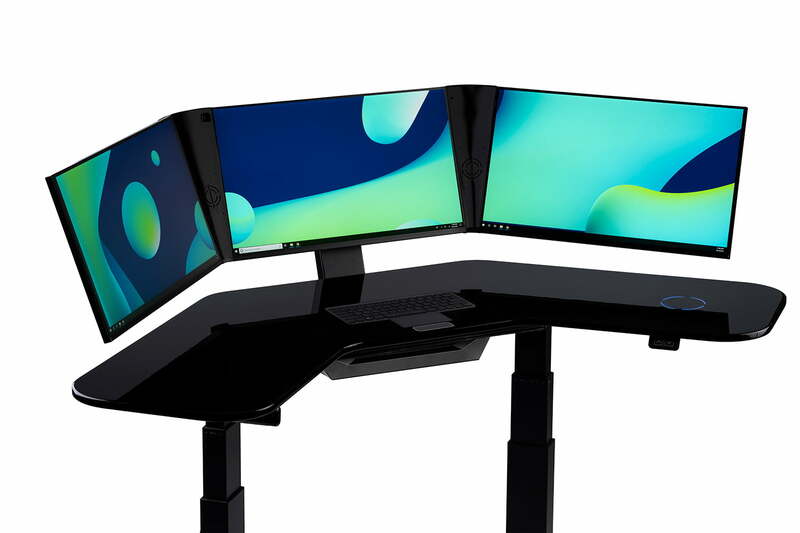 And that’s where the Cemtrex Smartdesk comes in – an adjustable standing/sitting desk with an integrated high-end Intel-based computer, a custom triple-monitor solution, and so, so much more. The system itself is tucked underneath the desk, with the ports easily accessible in your lap, just beneath the surface of the desk. The top of the desk itself – a kidney-bean shaped slab – has an integrated touchpad, keyboard, and Qi-charger, meaning your phone is at hand and always charging. Then there’s the integrated Leap motion sensor, which lives right between the touchpad and your chair. Working with Microsoft, Cemtrex built a series of custom gestures to control whatever’s on screen: Swipe your hand in the air over your keyboard and you can scroll a document, prowl through presentation, cut and paste, and more. Cemtrex calls it the “Stark” system, a nod to Tony’s crazy system in Iron Man. No, we’re not quite there. But Cemtrex has taken us awfully close. Sure, gestures are built into Microsoft, to some extent, but there isn’t a robust library of them, and they seem to change based on the system you’re using, meaning they almost always end up feeling unfamiliar. The 1,920 × 1,080 touchscreen displays (72 inches of screen real estate in all) are a standout feature, of course. They’re connected by curved plastic joints that hold other components of the system: a pair of speakers, a camera for video conferencing, and a unique document scanner, which points down toward the top left of corner of the keyboard. Simply drop a piece of paper anywhere in range of the camera and hit scan in Cemtrex’s custom software. The program will automatically detect the edges of the document, scan it for you, and bring up a PDF. No need to align it precisely, much less get up and walk to the copier. Oh, and for those times when you need a little privacy, the company has manufactured its own set of wireless earbuds, with a clever charging drawer tucked neatly under the left side of the desk. This in conjunction with a software client from the company lets you take advantage of your company’s existing VoIP solution. Your desk just became your phone, too. 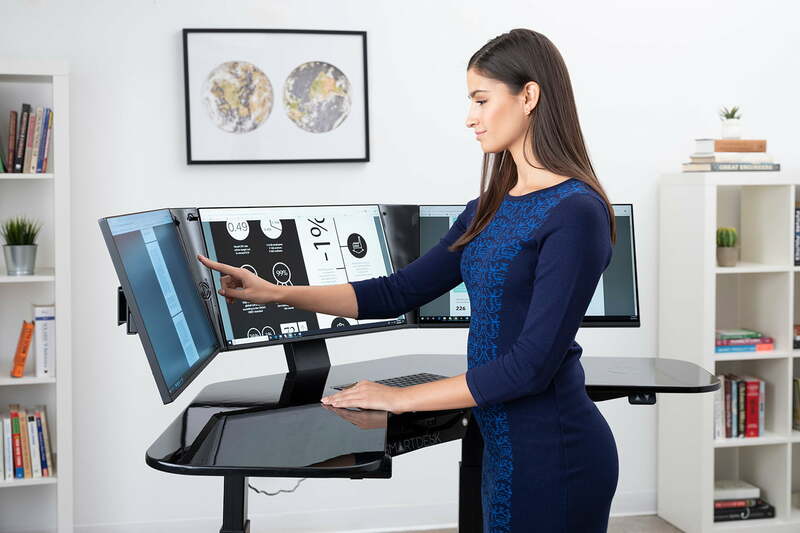 The Cemtrex Smartdesk comes in two models: a high-end version that starts at $3,599 and an even higher-end version that starts at $5,300. Both models are available in piano black or matte finishes. The Iron Man suit? That’s extra.